It’s amazing what happens when people combine their passions with a vision to help others. That’s the story of the Wheels4Water team. On September 10, a team of cyclists from around the country will ride across the United States in 10 days to bring awareness of the world’s water crisis and relief for thousands of children and families in Uganda. 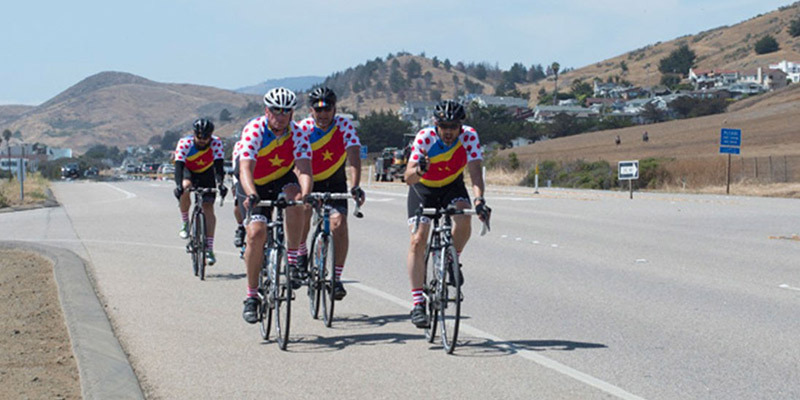 Riding nearly 300 miles per day, the Wheels4Water 2017 team will start in San Diego, California and ride in shifts until they reach Charleston, South Carolina on September 19th. The group aims to raise $200,000 by the time they finish, and is already well over halfway to their goal. Wheels4Water has worked with Lifewater since its inception. Ahrens has travelled with Wheels4Water co-founder Brian MacDonald to Uganda and the Democratic Republic of Congo (DRC) to see the need for safe water and Lifewater’s work first-hand. Since 2014 Wheels4Water has raised over $230,000, benefitting thousands of children, women, and men in Uganda and DRC. Each year since 2014 the group has cycled a different part of the United States and different team members have joined, but this is Wheels4Water’s longest ride and most ambitious goal yet. All funds raised will support families in Kaliro, Uganda to access safe water, sanitation, and hygiene. In Kaliro, 67% of residents lack clean water, and 71% have no safe place to go to the bathroom. The 2017 team has been training for months to work up the stamina to ride several hours and scores of miles each day. They begin early morning on September 10 and will ride continuously until the finish. Please pray for their safety on the road and strength through difficult weather and long miles. You can learn more about each rider, why they ride, support the ride, and get updates from wheels4water.org. The team is also selling cycling gear and designer posters to raise money. The 2017 team riders include Ahrens and MacDonald as well as Tony Narducci, Dave Weller, and Daren Wendell. As leader of Rule29 and father of four, Justin enjoys digging into a business problem and designing a strategic solution. But he gets a bigger charge out of seeing the positive impact that solution can make – for the client and for the world. As a creative, he believes that we are built to see the world differently than most. Justin hopes that, through initiatives like Wheels4Water, he will be able to make positive changes in key global issues while also transforming himself, his company, and help influence the design industry as a whole. As a visual story teller Brian uses his photography and film making at his company, Wonderkind Studios, to challenge people to look at ideas from a different view. He is in constant pursuit of that elusive moment that makes people slow down and consider a new possibility. He continually challenges himself to shift views, and honestly, quite often fails. But there have been small victories as he has been able to share the stories of incredible people struggling in unbelievable circumstances. It is for those people that he’s doing this ride. Tony has established himself as a leader in the print industry in Arizona over the course of a 35+ year career and as CEO of O’Neil Printing. Tony is not only a loyal supporter of Wheels4Water and Lifewater International, but an experienced rider and integral in the management and logistics of the rides. An accomplished public speaker, Daren regularly shares about the global water and sanitation crisis at conferences, churches, youth groups, schools, and businesses. Some of his athletic accomplishments and personal campaigns to raise money for safe water include walking 3,400 miles of the United States, cycling 4,400 miles from Oregon to Virginia, competing in several marathons and ironman events, swimming 50.6 non-stop miles across Lake Michigan in under 35 hours, climbing Kilimanjaro, and running 100 marathons in 100 days across the United States. Dave is an EVP/Managing Director for AmWINS Insurance Brokers. “Water – we don’t think about it much because we have it readily available,” says Dave. “But if you took it away, we had to walk hours to get clean water, or settle for dirty, unsanitary water, then we’d think about it a lot.” Dave has been regularly involved in cycling fundraising events for Lifewater, annually riding a 100-mile uphill route from the ocean to a mountain peak, and took a trip with Lifewater to the remote regions of Ethiopia, which solidified his commitment to the safe water cause. He will be part of the Wheels4Water cycling group as they make their way across the country, as well as helping coordinate the logistics and daily plans. Steve Staman has three children and six grandchildren. For most of his adult life, he participated in a variety of ministries. Steve has volunteered with Youth for Christ for ten years at a detention center for at-risk kids. For the last ten years, Steve and his late wife took many short and extended camping trips which covered almost every state in the U.S. Steve is pleased and feels privileged to provide and drive his motor home as a support vehicle for such a worthy cause as Wheels4Water. Additionally, Wheels 4 Water’s 2017 is sponsored by many great businesses around the country. Find them and join them here.